Alaska is known for many things—epic outdoors, fresh seafood, wildlife encounters—but it has also staked its claim as a state that appreciates a good cup of coffee. 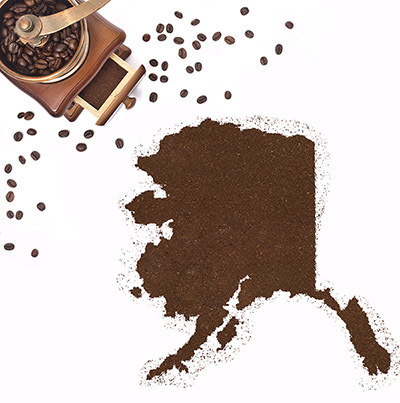 The Lower 48 may be ahead of the game in many respects, but Alaskans have been pioneers of all things coffee for decades. If you’re a caffeine fiend, rest assured that no matter where your Alaska adventure takes you, there is likely a coffee shop (or two or three) nearby. Here are some favorite places around the state to enjoy a good brew. It’s no wonder Alaskans love a hot, freshly brewed cup of joe. It makes for the perfect warm-up on a cold morning, which there are plenty of in this city north of Anchorage. All coffee at College Coffeehouse are fair trade and locally roasted at North Pole Coffee Roasting Company, which has been in the specialty coffee business for more than two decades. College Coffeehouse offers three roasts—Mexican, Decaf Mexcian or Gourmet Dark Roast, a blend made specifically for the popular spot. If your Alaska travels take you to Denali National Park, don’t pass up a stop in the quirky town of Talkeetna. In addition to serving organic, Alaska roasted coffee and espresso from K-Bay Caffé in Homer, Flying Squirrel Bakery Café prides itself in creating a variety of fresh, hearty and wholesome pastries and meals prepared with local and organic ingredients. In fact, many of their culinary creations feature ingredients straight from their family farm, Talkeetna Grown and Birch Creek Ranch. Pop in to see what the menu is—it changes every day! This cozy coffee house, also in Talkeetna, is a favorite among locals and visitors. The small but inviting atmosphere is the perfect stop to pick up a specialty coffee, fresh juice, smoothie or milkshake. Enjoy it in-house or take it to go as you explore more of Talkeetna or head on your way to Denali National Park. Kaladi Brothers is a name you’re bound to hear at least once during your trip. The coffee roaster has several locations across the state and even one café in downtown Seattle. Kaladi is known for the unique taste of its air-roasted beans and the variety of blends they offer. The Kaladi location in downtown Anchorage is convenient whether you’re on your way to brunch, need a mid-afternoon pick-me-up, or an after-dinner latte. The seaside town of Seward has a variety of coffee options, but a favorite is Resurrect Art Coffee House. An old church, built in 1916, is home to the café, which features a loft, live music and art shows year-round. Sit outdoors in the sunny garden and sip on an espresso before you shop for gifts and artwork made by Seward artisans.